Editor’s note: The original version of this story reported on recent developments in Finland that had the Finnish government poised to introduce tuition fees for students from outside the European Economic Area. The government subsequently determined not to do so and has referred the matter to a ministerial working committee for further consideration – effectively meaning that fees will not be introduced until such time as a stronger consensus to do so emerges within the Finnish parliament. We have accordingly updated the post to reflect these latest developments. Finland will remain – along with Germany, Norway, and Iceland – one of the four European countries that do not charge tuition fees for university studies. In what has been characterised by Finnish broadcaster YLE as a “u-turn on tuition fees” the government has backed away from a plan to introduce fees for students from outside of the European Economic Area (EEA). The issue has now been referred to a ministerial working committee for consideration, and it is unclear when or how the government will revisit the issue in the future. The question of tuition fees for non-EEA students in Finland came back into public view in October with a government proposal tabled by Minister of Education, Science and Communications Krista Kiuru. Under the plan outlined by the minister, Finland would have introduced tuition fees for non-European students as of 2016. The October proposal was, to say the least, unexpected. While the question of international tuition has been regularly debated in the Finnish parliament in recent years, it has not received strong support in political or academic circles. Indeed, earlier proposals to raise fees for students from outside the EEA have been widely panned by student groups in Finland. And a pilot project to levy fees at 19 Finnish institutions concluded earlier this year with no strong findings in favour of international fees, and little apparent enthusiasm for the subject among participating universities and polytechnics. Minister Kiuru’s proposal would have seen fees apply for students from outside the EEA – that is, outside of the 28 European Union members as well as Iceland, Liechtenstein and Norway – beginning in 2016. While institutions were expected to have discretion in setting their own fees, the government proposal prescribed a minimum tuition of €4,000 (US$5,000) per year, to apply only for degree programmes taught in languages other than Finnish or Swedish. Exchange students would not have been affected by the proposed policy. Finland hosts roughly 20,000 international students today, including both exchange students from within Europe and visiting students from beyond the EEA. Roughly half of them stay on to work and contribute to the Finnish economy following their studies. Non-EEA countries, particularly those in Africa and Asia, account for a surprising percentage of total international enrolment. In fact, non-EEA markets in the top 15 source countries outlined above account for about 60% (10,431) of all foreign students in Finland. and explored the longer-term impacts of students staying on in Finland after their studies. In part, both Mr Kallunki and Mr Seitsalo were reflecting on the same question: to what extent could the introduction of tuition fees cause non-EEA enrolment in Finland to drop? In this respect Finland has a close-to-hand example to consider in the case of Sweden, and Sweden’s experience may have been an important element on which the debate in Finland turned. Sweden introduced fees for non-EEA students in 2011 and non-European enrolment in the country promptly plummeted. The Swedish Higher Education Authority reports that non-EEA enrolment in Sweden dropped roughly 80% from fall 2010 to fall 2011 (the point at which international fees were introduced). As the following table reflects, non-European enrolment has recovered modestly in the years since, in large part due to the recruitment efforts of Swedish institutions (and the country’s international education bodies) and with expanded scholarship support for visiting students. 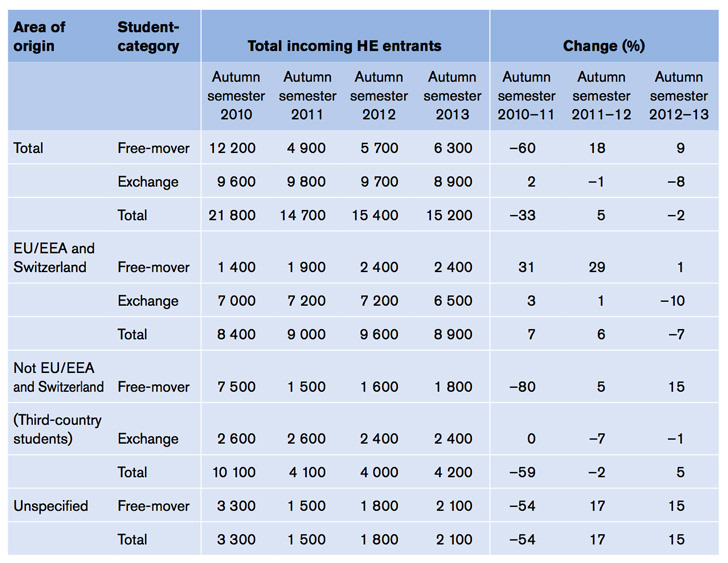 Please note that the term “free mover” is used in the table to indicate students who come to Sweden outside of a formal exchange programme (including non-EEA students which accounted for about 61% of “free movers” in Sweden in fall 2010) and are therefore more likely to have been affected by the introduction of foreign student fees. This sharp shift in enrolment from 2010 to 2011 is shown even more graphically in the following chart. It doesn’t automatically follow that the impact on non-EEA enrolment would have been the same in Finland as it was in Sweden. However, the similarities between the two countries are notable. They share a similar geography and competitive profile in the global education market. And Finland today has a level of international enrolment comparable to that of Sweden in autumn 2010. One important difference, however, is that non-EEA students account for a slightly higher proportion of Finnish enrolment today (than was the case for non-European students in Sweden in 2010) – 60% for Finland versus 50% for Sweden – and Finland may therefore have had somewhat greater exposure to enrolment declines following an introduction of international student fees. There are of course other variables that could mitigate any negative impacts arising from the introduction of international fees, such as expanded marketing and recruitment efforts, and increased funding for scholarships or other financial supports for non-EEA students. As we have noted in the past, such strategies can play an important part in countering any downward pressure on student numbers arising from tuition increases. For the moment, we can only wonder what the impacts of tuition fees for non-EEA students would have been in Finland, at least until such time as the Finnish government opts to revisit the question again. This entry was posted in Agents, Europe, Finland, Higher Education, Regions, Vocational and tagged European Union student recruitment, student recruitment, study abroad, student enrolment, scholarships for foreign students.